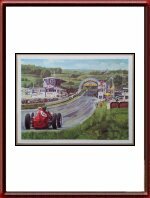 Ferrari Factory Poster of Mike Hawthorn en route to victory in his Ferrari 246 in the 1958 French Grand Prix at Reims racetrack. Incidentally, this was to be Mike's last victory ever as well as Juan Manuel Fangio's last F1 race ever. 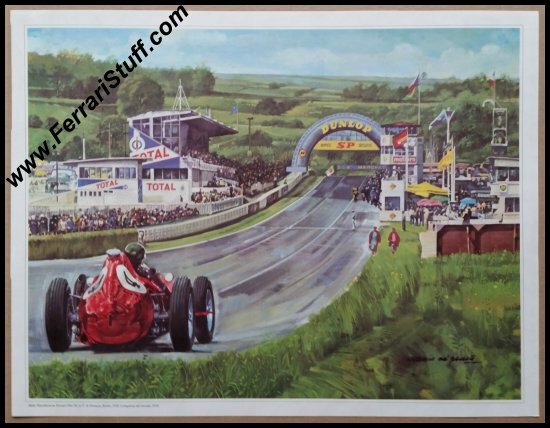 The artwork is by Antonio de Giusti, a personal friend of Enzo Ferrari's and the man that was responsible for so much of Ferrari's hand drawn artwork for brochures etc. in the 1950's and 1960's. Originally, Ferrari published this poster as one of a series that was bundled in the 1980 Ferrari calendar named "Ferrari Campione del Mundo". Apart from the calendars, which are a very rare sight nowadays, also a limited number of each of the drawings was issued as an art print. 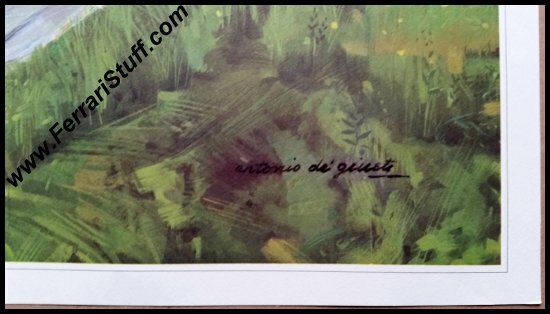 This is one of those art prints and came from Antonio de Giusti's personal "stash". 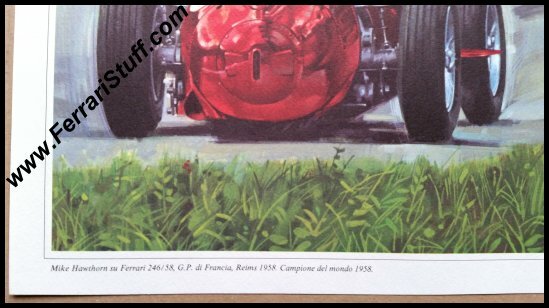 These art prints do NOT carry a Ferrari print number. It measures approximately 53 x 41 cm or 21 x 16 inches. This print will be shipped, rolled, in a sturdy tube.